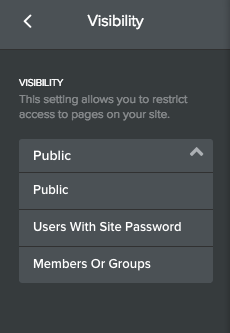 Every page on your site has a Visibility setting that defaults to "Public". This default setting, of course, means that any visitor to your site can see the page. You can view and change this setting by selecting the Pages tab, selecting your page in the Pages sidebar, and clicking Visibility. Changing this setting allows you to limit access to any page so that only registered members (or even just certain registered members) can see it. If you set a page to only be accessible to Specific Members or Groups, then you'll need to choose which Members / Groups will be able to view the page. 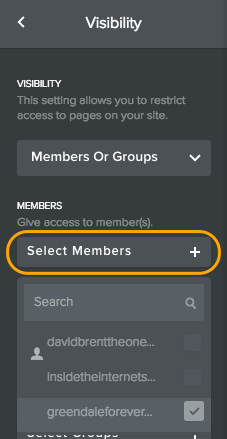 The Select Members button will display your entire list of members so you can select specific individuals who will be allowed access to the page. This is really only useful if you have a small number of members. 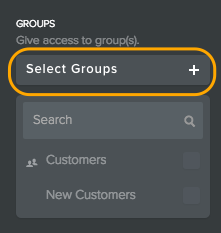 The Select Groups button gives you more control over larger numbers of people by enabling you to provide access to a group (or groups) of members you've previously created. Once you've limited visibility in this way (and republished your site), only the members or groups you've selected will be able to access the page.